Digital disruption impacts organizations across industries. To stay relevant, they need to implement change faster and provide customers with continuous value. While many enterprises are focused on continuous delivery, their ultimate goal is to provide value on demand. The Scaled Agile Framework (SAFe) is a freely available knowledge base of proven, integrated principles and practices for Lean, Agile and DevOps, that organizations can use to provide high-quality value to customers in the shortest sustainable lead time. Value delivery starts with an idea or a hypothesis about what customers need. Those needs must be continually explored and evaluated to ensure that the end product aligns with customers’ desires. Meanwhile, Agile teams need to continuously build and integrate those systems and solutions, and continuously deploy them to production where they can be validated and await the business decision to release. A common mistake is to attempt an Agile transformation without DevOps or vice versa. Agile without DevOps creates quality work that cannot be delivered to the customer fast enough, so it fails to achieve the ultimate economic results. Conversely, DevOps without Agile provides an underutilized pipeline at best. At worst, Agile teams deliver the wrong things faster. Most DevOps teams focus on automation, but effective DevOps requires much more. Scaled Agile recommends a holistic approach to DevOps that includes Culture, Automation, Lean Flow, Measurement, and Recovery (CALMR). Culture. DevOps is built on a culture of collaboration between silos. 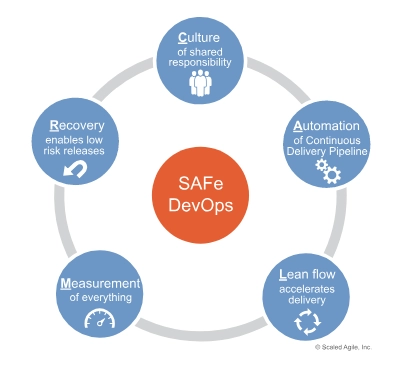 SAFe provides the construct of an Agile Release Train (ART)—a team of Agile teams—who work together to build, deliver, and operate the solution. The mindset of risk tolerance and knowledge sharing enables everything else. Lean Flow. Ensuring work in small batches, managing work-in-process limits and queue length is crucial. Large batches and bottlenecks slow down delivery, so identifying and solving them is a key activity for a Lean enterprise. Measurement. DevOps need to continuously evaluate the delivery pipeline and its associated results. Enterprises must build telemetry that allows them to find the bottlenecks in flow as well as identify whether the value they are providing their customers is the what they need. Recovery. Fast delivery is too risky if procedures for recovery are built without rehearsing failures. 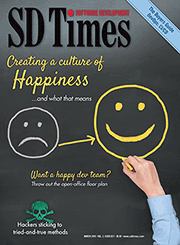 Organizations must consider how they can react quickly to problems by rolling back or fixing foreword. One of the hardest questions enterprises face as they undergo a DevOps transformation is deciding where to start. SAFe DevOps course answers that very question. The experiential class allows attendees to map their existing delivery pipeline and identify the time and quality bottlenecks that impact flow using SAFe. Course participants also use the SAFe DevOps Health Radar to understand their level of maturity in each of the 16 sub-dimensions of the pipeline. They then proceed to create a future state pipeline by identifying skills across the four dimensions of the delivery pipeline—Continuous Exploration, Continuous Integration, Continuous Deployment, and Release on Demand—that will improve the identified bottlenecks. By the end of class, the teams have identified the top three improvement items that would provide the best results in their environment.